Kantharodai Viharaya is a place where you can spot the famous dagobas (stupas) in a town which is famous for its Hindu architecture. 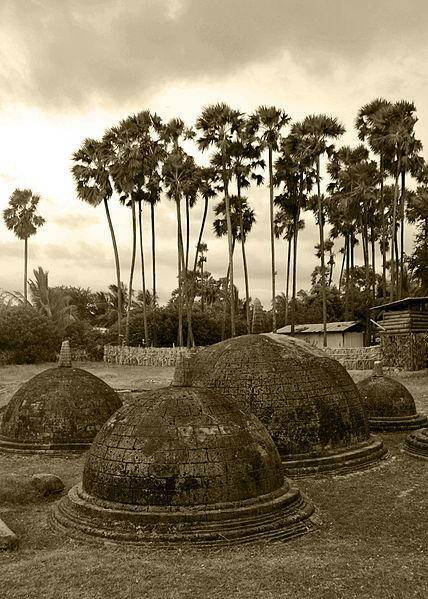 Located near Chunnakam and near to the Jaffna town, you can find numerous dome shaped stone structures here, varying in their size, the largest being 12ft in diameter. At some places it is mentioned that you can find almost 60 stupas at this spot! Nestled between the Palmyra trees, this place was first discovered by Dr. Paul E. Pieris in 1916. The history of the pagodas and the items found during the excavation adds to the mysteriousness of this place. Some people claim that this site was used as ancient burial site for around 60 senior Tamil monks, hence the 60 stupas found here. This was the first site to be excavated by the Archaeology Department of Sri Lanka, and many treasures were found buried beneath this place. It also serves as symbol of harmony between the Buddhist and the Hindu culture in Sri Lanka since the local people believe this spot was used by Tamil monks as religious site. The Kantharodai Viharaya is one of the few places which show that Buddhism was older than almost all other religions in this area. It deserves a visit for its deep rooted history and the mysteriousness attached to this place.